Manage Your Energy, Not Your Time! A personal Productivity and Growth workshop. When did you last take stock of where you are in life? What is it that's keeping you so busy? What truly, deeply matters to you and how much time do you give those areas of your life? BY TAKING PART IN THIS EXPERIENCE YOU WILL ALLOW YOURSELF TO SLOW DOWN AND REFLECT. The first step for change is to know exactly where we are starting from. What actually needs to change and what we're doing right. That's how we'll start! In the city that never sleeps, few of us truly take the time to slow down and reflect to take stock. With this experience, each participant will get a chance to do just that: slow down, and reflect. In this intimate setting at the beautiful and inspirational xixi studio and with a small group of fantastic people (9 maximum), you will give yourself the gift of a moment of self-care, a moment of connection and a moment of growth. Each of you will take quality time to look inward and prioritize what truly matters to you as you identify ways to continue to slow down and build habits that support sustainable practices. Through guided individual thinking activities as well as group discussions, this workshop will take you through a deep introspective journey to live your life with more clarity and connection. We will end with a beautiful guided visualization to help you slow down and embed all the thinking and ideas that came up. 2-2.30: Mingle and Introductions + The importance of slowing down. 3.00 - 3.30: Slowing down: what's keeping you busy? 3.40 - 4.00: Techniques for slowing down: tips and tricks! Yoga Nidra does not require movement, but you will be sitting on the floor, and lying down for deep relaxation so make sure you are comfortable! A pen and a notebook. You will want to make lots of self improvement notes! Can't think of a special gift for friends? They don’t need more stuff! Give them an experience instead... and they’ll get gift goodies too! Early bird tickets are available until February 17th! Please note that when you register for the event, you will be added to my mailing list. I will contact you through it for the event, but if you are not interested in receiving it after the event, feel free to unsubscribe! REMEMBER YOU CAN SAVE ON REGISTRATION FEES FROM EVENTBRITE BY CONTACTING ME FOR VENMO / PAYPAL PAYMENTS. DISCOUNTS WILL STILL BE APPLIED! Let's start 2019 together, connected and with a deep sense of purpose. I know, everyone is talking about purpose these days... What does that even mean? Our core values and purpose are what gives our lives meaning, they can guide our decisions and our behaviors... if we let them! Purpose is bigger than you or me, it's about what we give to the world and how we show up in it. As humans, we go through stages of psychological development, and with each stage, our values and purpose change. In order to truly explore our purpose, we must be prepared to let go of the values we are given by our parents and the various cultures we belong to (family, work, city, country etc.) so we can embrace the values and purpose of our own unique self. We achieve this personal growth through self-development. In this intimate setting at the beautiful and inspirational xixi studio and with a maximum of 13 participants, you will dive into your own values and their alignment with your life. You will discuss, share and question what gives meaning to your life and how you can participate in making the world a better place for all. This workshop will take you through a deep introspective journey to start the year with clarity and connection. We will end with a beautiful guided visualization to help you step into 2019 confidently and purposefully. 2-2.30: Mingle and Introductions + What is purpose? 2.30 - 3.00: 1) Life Assessment + 2) What do you truly desire? 3.00 - 3.30: Going back in time! Who have you been your whole life? Can't think of a special gift for your friend? She doesn't need more stuff! Give her an experience instead... and she'll get gift goodies too! Early bird tickets are available until December 26th! Did you know that "the rate at which people will actually help is understimated by roughly 48% by those who want to ask for help?". This statistic from Heidi Grant really shocked me! You are a high achiever and you never ask for help or accept it! That's ok! I'm a high achiever too! I understand that you have incredible ideas and you want to turn them all into concrete plans, you want to do that yesterday and no one can do it better than you. You might even feel scared and shrink at the idea of asking for help. Do you know that this reaction is due to the way our brain is wired to scan for threats? We assume that we will get rejected... But go back to the statistic above! Now, did you know that people WANT to help? It makes them feel good and by not asking, you are basically robbing them of the experience of feeling good! Asking for help is uncomfortable, yucky, annoying, hurts your pride and ego? If this is you, welcome to my world! You have knocked on the right door. In our last Meetup, we talked about setting boundaries, this time, we'll talk about letting others help us. I just saw you cringe! Let's do this together, we have 2 hours to get started, and that includes some deep relaxation to help you slow down, reflect and gain a different perspective. This is a community building event so you can pay what you can, starting at $10. You are a high achiever. That's ok! I'm one too. This means I understand that you have incredible ideas and you want to turn them all into concrete plans. I understand that you are incredibly successful at everything you do, yet, you think you're lazy and you don't dare tell others that things come easy to you. You can tell me - I feel that way too! If this is you, welcome to my world! You have knocked at the right door! I want to create a community in which it's ok to say "I'm a high achiever, I know that I can do anything I want and succeed but I'm lost and I don't know what it is I want to do." I want to create a community in which it's ok to say "Everyone thinks I'm working hard and they are inspired by my work, but I don't feel fulfilled and the work that appears so hard doesn't actually challenge me." One of the first things we need to do is help you set boundaries so you don't burn out. Let's do this together, we have 2 hours to get started, and that includes some deep relaxation to help you slow down to speed up! This is a community building event so you can pay what you can, starting at $20 and up to $50 no questions asked! As women we are socialized to be pretty, polite, nurturing and nice. Becoming an empowered woman and leader means hacking and rewiring our brains in order to tap our true power. 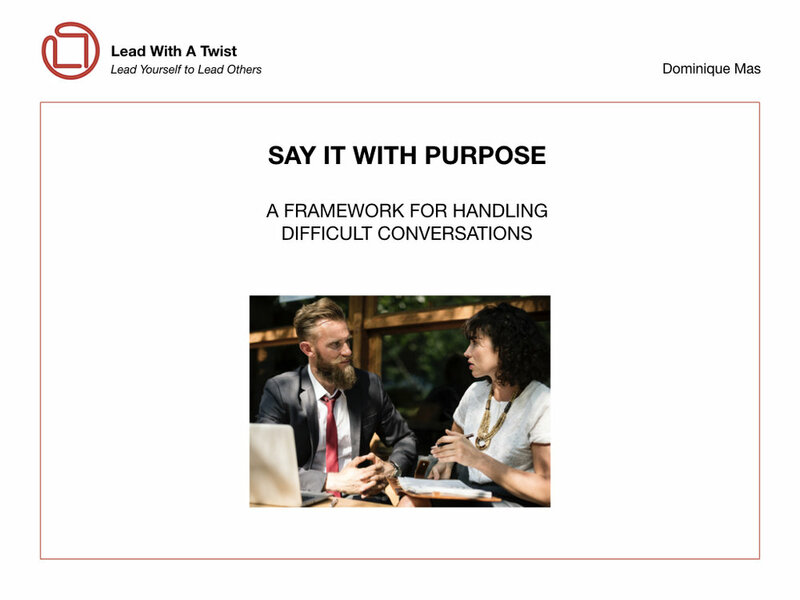 Vanessa Cameron from iSpark Collective and Dominique Mas from Lead with A Twist are thrilled to launch a live workshop series that provides a platform for women who want to connect or reconnect to themselves and cultivate their personal power. No matter who we are, or where we’re from, we each have super powers. Sadly, in today’s world we’re often too busy, distracted or disconnected to access them on an ongoing basis. In order to sustain our creative potential, mental clarity and sense of confidence we must learn to connect to ourselves regularly by implementing these 7 InPowerment Practices. About Vanessa Cameron, iSpark Collective: Through working closely with a coach for nearly a year and avidly journaling about my experience I realized that there were 7 larger themes of things I felt I needed to work through to claim a sense of empowerment in myself and in my life. A super achiever by nature I rarely slowed down enough to connect to myself, yet my chronic autoimmune disease forced me to slow down, connect to my deeper sense of self, listen to my inner voice and manage my most precious resource: my spark and internal source of power. About Dominique Mas, Lead With A Twist: After 15 years in educational leadership and 4 years of being a workshop leader for the International Baccalaureate Organization, I reflected on the transitions I had moved through in my life and soon realized these experiences were building towards starting my own private practice for coaching as well as designing and facilitating workshops to help others develop internal self-awareness. I combine my Masters in Leadership and Change, Coach Training with the NeuroLeadership Institute and my Yoga Teacher Training experience to lead and support the workshop participants as they identify their own ideal solutions and deeply connect to themselves to feel truly InPowered. Dominique and Vanessa met through Dreamers and Doers and are excited to share this method and practice with you and your company! Have you ever felt a disconnect between what you do and what you believe? Unfortunately, our behaviors often flow from our environment rather than our values. Have you ever felt like you’re serving others but forgetting to take care of yourself? We know that paying attention to what fuels us and allowing ourselves recovery time is the only way to stay focused and productive as we lead others with purpose. Did you just say self-doubt? Impostor syndrome? We need to listen and trust ourselves in order to speak up, celebrate and challenge ourselves! Think deeply about your own relationship to confidence. In this session you will lie down for 30 minutes and go through a deep relaxation process which includes visualization. This technique aims to relax the body to help you access the state between conscious and nonconscious, allowing you to process all the thinking you did through the day. The following 30 minutes will allow for final individual reflection time and a short group reflection. The last 30 minutes of this event will be about feedback and ideas for improving the event. This is a pilot workshop! Future events will be priced around $350 for the day but we are offering the pilot for $75 for the WHOLE DAY!!! This will help us cover the cost of the venue etc. In exchange, we will need your written feedback as well as some video feedback we can use to promote future events. We will also have a photographer present for the first session. We'll take a group shot at the end of the event. Did you just say "self-doubt"? "Imposter syndrome"? What I heard is "I am giving away my power, help me own it"! This small group workshop / coaching session with Dominique will have you reflect on confidence and give you simple tools to change your mindset and create your path to confidence. Think deeply about your mindset. Create a path to confidence. We will start by learning about the brain and how it plays tricks on us! You will leave with a framework for considering your growth and build your confidence. After all this thinking, you will need to reflect and recharge through Yoga Nidra. This is a deep relaxation technique which helps you access your subconscious and embed the thinking you did previously. There is no movement and you will simply lie down and listen to my guidance. This should set you up to start the weekend nice and relaxed! - One bottle of Harmless Harvest Coconut water provided for all! - You meet some new friends and make meaningful connections. - You can hang in the park before or after and get some outdoors time. - A yoga mat or blanket to sit and lay on AND a blanket to cover yourself during Yoga Nidra. Your body temperature will drop as you will be lying down for a long time. - A sweater in case it's cold! - Refunds will be given to all if the weather does not permit! - Pay what you can from $15 to $30, no questions asked! THIS EVENT IS NOW SOLD OUT - BUT I ADDED ANOTHER FOR SEPTEMBER 9TH! Become the Empress of Your Time in Prospect Park! Have you ever felt like you're not in control of your time? Have you ever needed to improve your focus? This small group workshop / coaching session with Dominique will have you reflect on the way you work and give you simple tools to perform at your peak so you can have more time to do the things you love. We will start by learning about the brain and its limitations so we can undertsand how to work around them. We will then explore the concept of flow and techniques to help you create it. You will leave with a framework for thinking through how you manage your energy and attention and tools to be more productive. After all this thinking, you will need to reflect and recharge. You will do this through Yoga Nidra. This is a deep relaxation technique which helps you access your subconscious. There is no movement and you will simply lie down and listen to my guidance. You will enter a meditative state of consciousness. This should set you up to start the weekend thoughtfully! - Coconut water provided for all! Join me for this FREE webinar and gain new tools to handle difficult conversations. How often do you operate in your default mode? How many old patterns no longer serve you? This workshop / coaching session with Dominique will have you reflect on habits and give you simple tools to create new habits to create the life you want. Learn about the way our brain hardwires everything it can. Identify some old wiring and learn how to overwrite it by creating implementation intentions. Reflect and meditate through Yoga Nidra. We will start by learning about the brain and how it creates habits and I will then take you through a process to help you create new habits. You will leave with a framework for thinking through your habits and changing what no longer serves you. After all this thinking, you will need to reflect and recharge. You will do this through Yoga Nidra. This is a deep relaxation technique which helps you access your subconscious. There is no movement and you will simply lie down and listen to my guidance. This should set you up to start the week nicely and truly relax on Sunday evening! A yoga mat or blanket to sit and lay on AND a blanket to cover yourself during Yoga Nidra. Your body temperature will drop as you will be lying down for a long time. A sweater in case it's cold! Refunds will be given to all if the weather does not permit! Pay what you can from $15 to $30, no questions asked! Become the Empress of Your Time in Central Park!